Marseille features in the Independent (22 Mar 08) as being one of the top 10 travel terminals in the World for its new airport terminal, but a brickbat for the Marseille Ferry Port as one of the grimmest. A new-look terminal, named MP2, opened at Marseille/Provence airport at Merignane especially for low-cost flying. Uniquely the terminal is designed to eliminate many services (and the associated costs) normally provided at airports. So passangers will take bags to the scanners themselves to reduce reliance on check-in staff and people will walk across the tarmac before boarding – no buses or walkways. All very much in the “no frills” mode, but at least the airport tax will be halved for domestic flights and reduced by up to 85% on European flights. The décor inside the terminal is also be “cheap and cheerful” with a combination of pink and green, purportedly symbolising a new dawn and a new way of travelling. I suspect that if the terminal works efficiently and processes you and your baggage quickly and easily then who can bemoan the lack of other facilities. On the other hand it could be a little more trying if there are significant delays. Terminal One remains and will continue to be more traditional, albeit hopefully less crowded than before for those travelling with the major airlines and paying more (usually). At the other end of the scale, the Marseille Ferry Port is far from welcoming – delapidated industrial infrastructure which is reminiscent of Marseille’s rather dubious and dangerous reputation. But it is a gateway for reaching many other parts of the western Mediterranean including Corsica, Sardinia and north Africa. The other alternative connection for Marseille is of course with the train, with Eurostar from another of the featured top 10 terminals i.e. the new St Pancras Internation station in London. The TGV line down through France to Marseille is very fast and goes through some glorious scenery as it tracks the Rhone Valley into Provence. 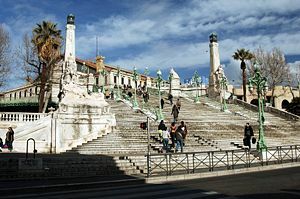 Your destination is then the Gare St Charles (see picture above) with its spectacular staircase (escalier) outside – a very traditional and ornate 19th Century railway terminus in the centre of the city. In the summer you can get from London to Marseille with a change of platforms in Lille, rather than a change of stations in Paris (Gare du Nord to Gare de Lyon).